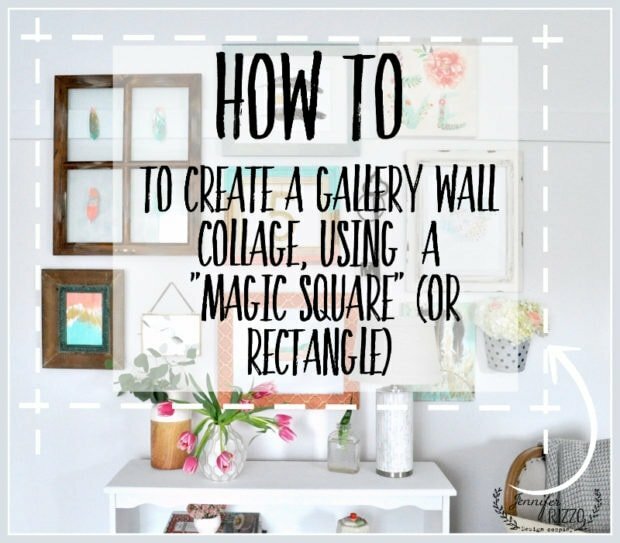 I think creating a gallery wall collage can be intimidating if you don’t know the tricks. You can make an really awesome one, even if your frames an items are all completely different. 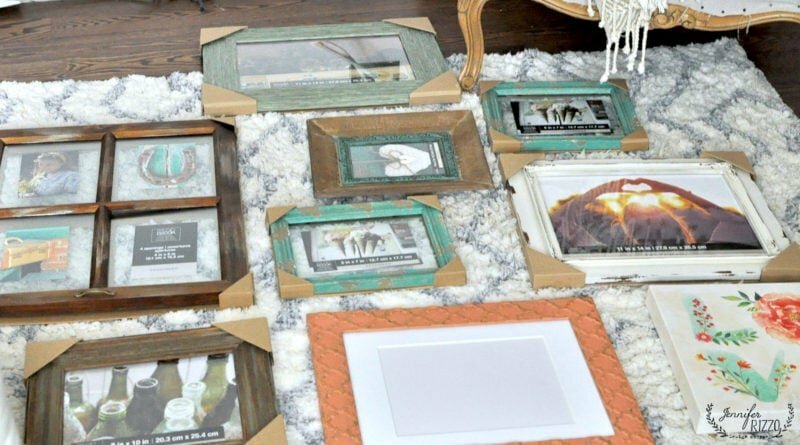 I was recently asked by Micheals (this post is sponsored and contains affiliate links) to use some of their items from their Savannah collection to make a gallery wall. 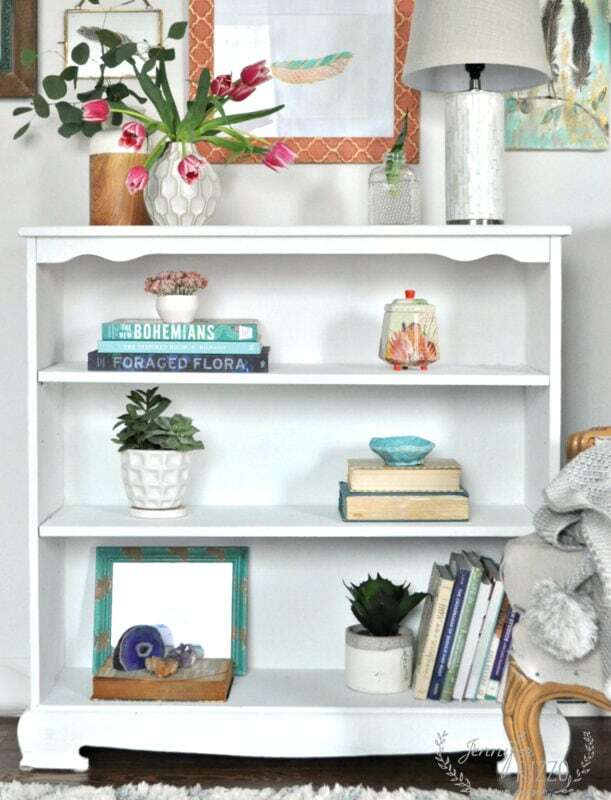 This collection is exclusive to Micheals, and are easy to mix and match to make your own custom gallery wall collage! I’m going to share how-to with you, using a few very simple tricks and tips! 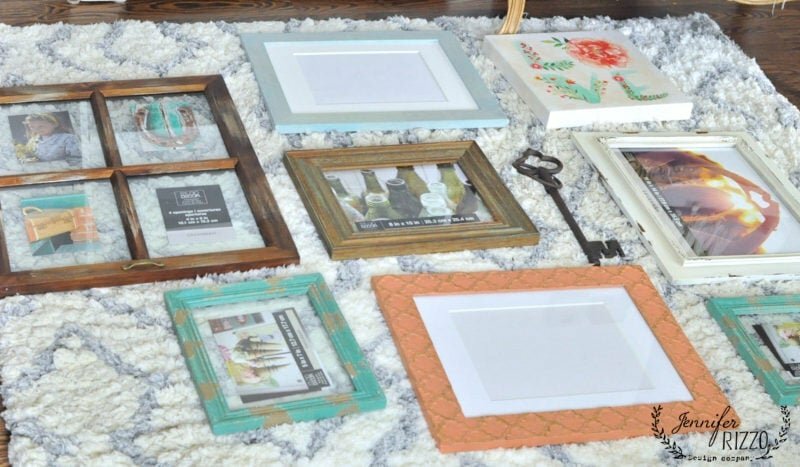 I started by laying out the frames I wanted to use from the collection. To personalize it, I pulled some of the frames and added in some of my own artwork and items. I also played with the arrangement bit. Even with clients, I always work it out on the floor first before any nail, screw or sticky hanger goes up. I like to use what I call the “magic square” (or rectangle) technique. 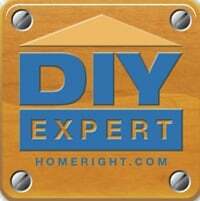 Imagine all of your items have to fit in the inside of a certain size square or rectangle. Put your focus piece in the middle and arrange from there. It really helps figure out the bigger puzzle, because really, that’s what a collage wall is. A big puzzle. I changed it a few times until I decided on my focus piece and then built around that, and worked out my pattern. You can see from my first two layouts, they were quite different. For my focus piece, I added an empty frame of my own, and a vintage brass 5 in the center and built around that. 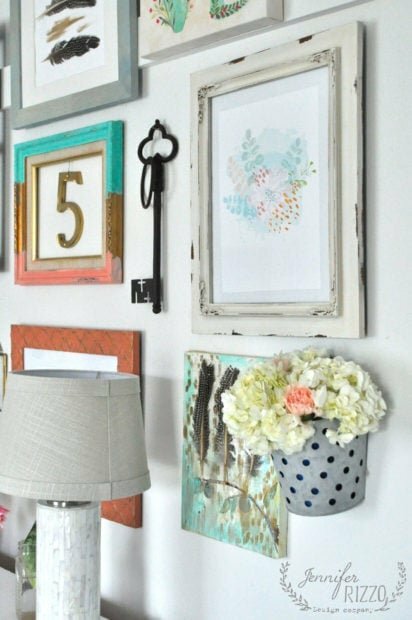 Gallery walls can contain artwork, personal photos, or even a combination of the two. 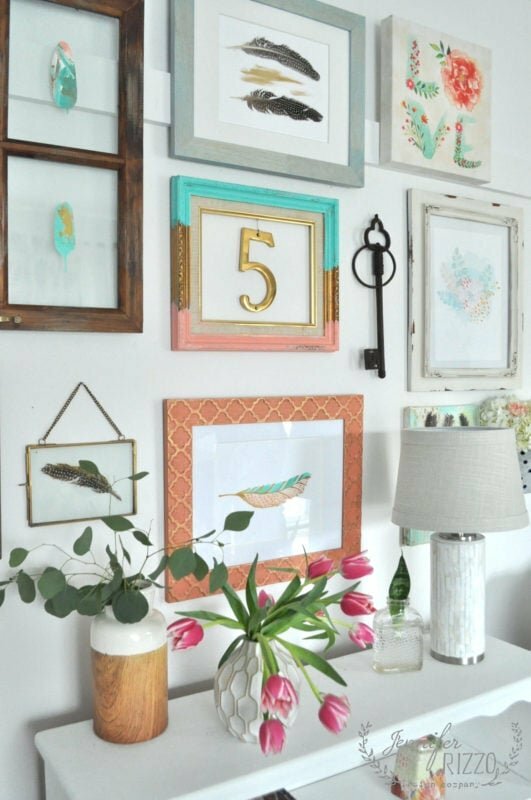 I used my own artwork (with the exception of the Peony Love canvas), real feathers from the craft store, and prints in my gallery wall collage. For even spacing, it’s important to pick one size. I kept about 2 inches of space around all of my items no matter their size or shape. 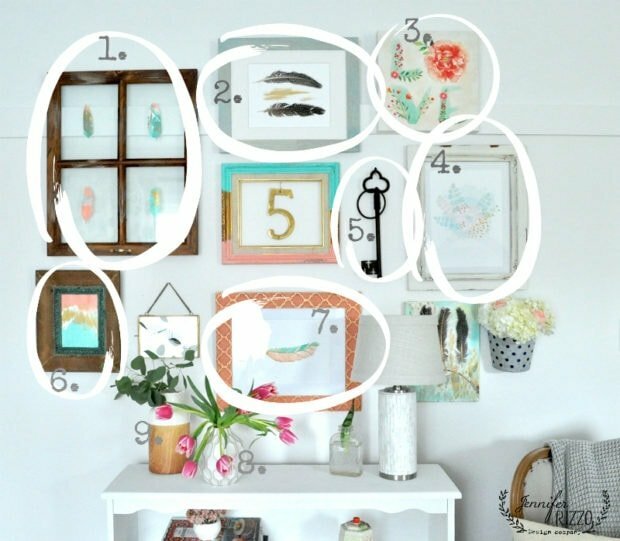 I circled all of the items below you can find at Michaels, in case you are interested in grabbing some for yourself! 8. and 9. are vases from their coastal collection, but they don’t sell them on-line from what I can tell. I went with a kind of boho feather and color theme. For the top picture in a blue frame,I took real feathers and glued them on paper with hot glue and a swish of gold paint. Super easy and cute! 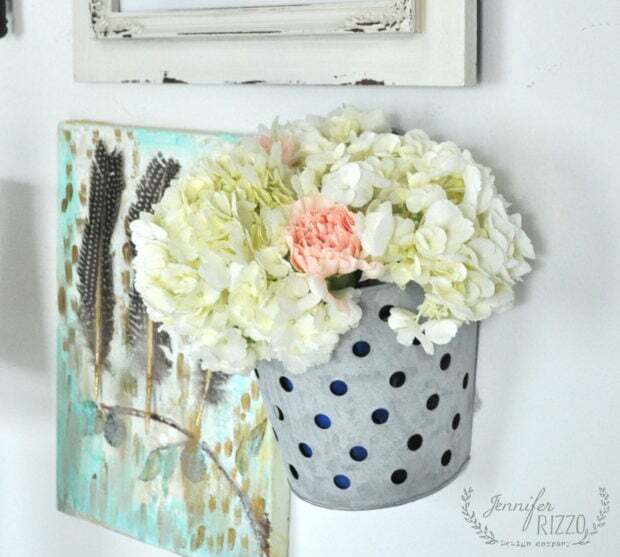 I had a galvanized pail that’s actually for office supplies, and loved the idea of having real flowers in my collage gallery wall. They didn’t last more than a few days, even in a hidden cup of water, but they looked pretty while they lasted. 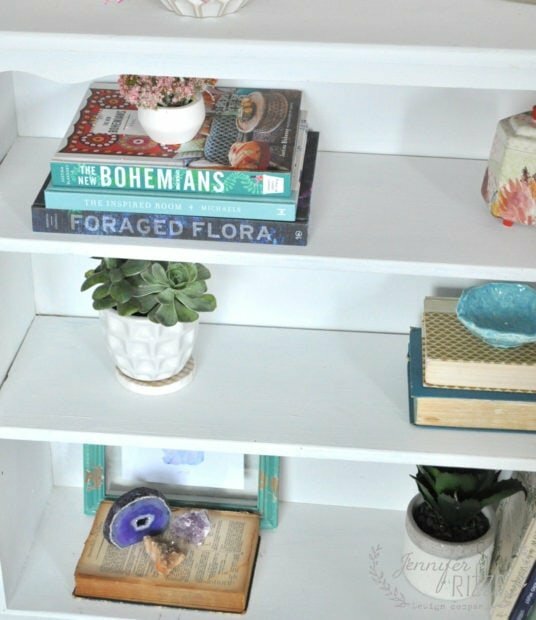 I used a bookcase as my anchor, and had fun styling that too. It was fun to add in color and natural elements. 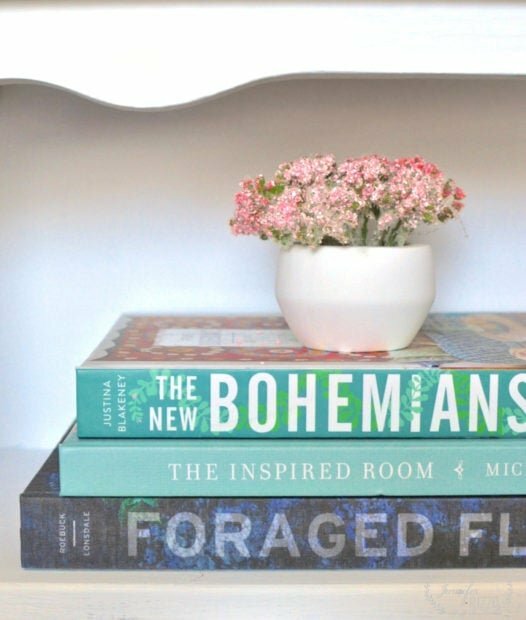 These are some of my favorite books, and I love the colors for this project! 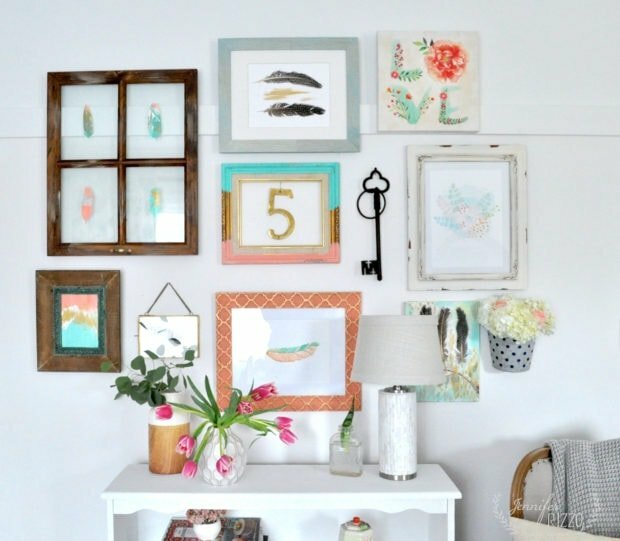 You can make your own easy as 1-2-3 gallery wall collage using the Savannah collection from Michaels. And,you can also use a 40% off coupon for your next visit! 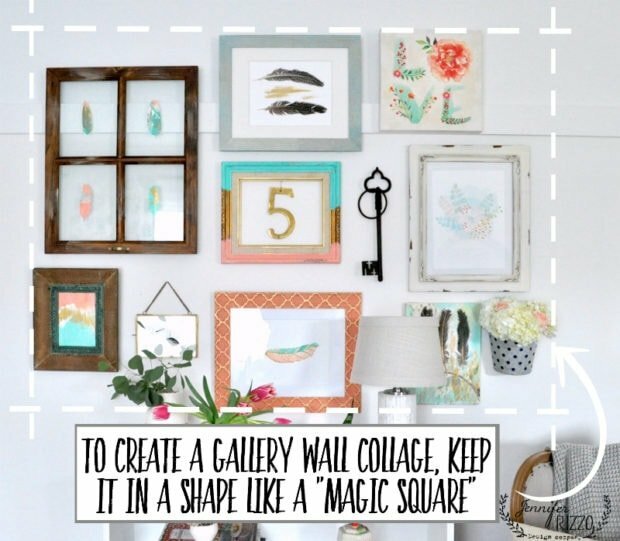 I hope you are ready to tackle your own gallery wall collage!! 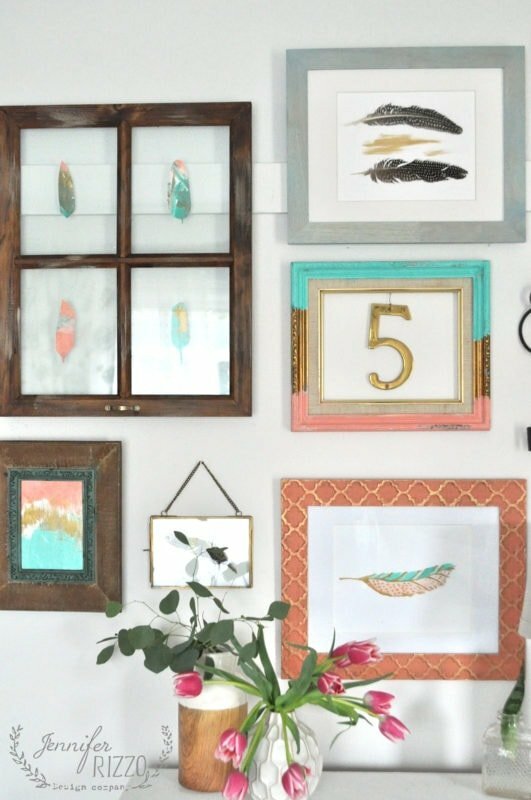 You can learn more about the display rules of 1-2-3 here , or how to use the tools that stores use of merchandising and display in your own home! 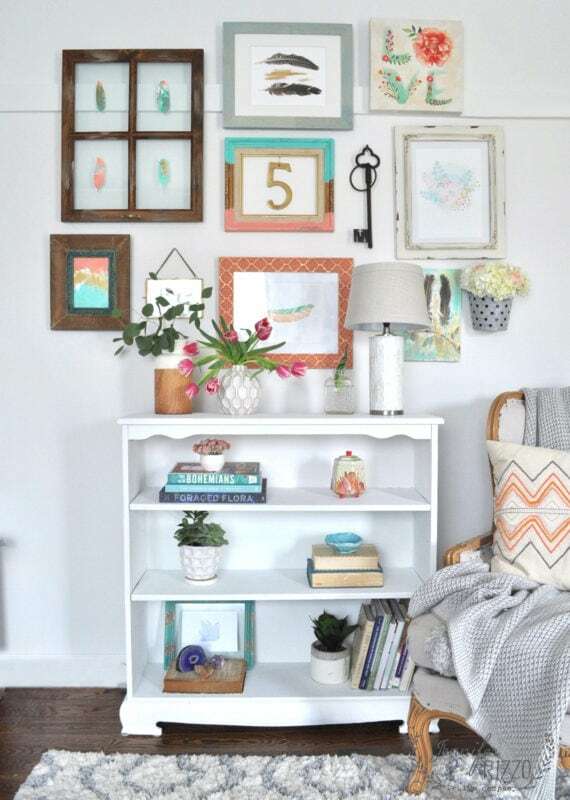 Love your gallery wall. The colors are GORGEOUS!! 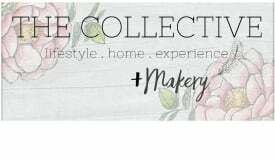 I love your tips and all the little creative elements you use to personalize everything so beautifully, Jen!